Hailed as a “talented young player” with “the skills to go far” by Westword (Denver) and “A fiery alto saxophonist and prolific composer” by the Star Tribune (Minneapolis), Aakash Mittal has been making a name for himself at home and abroad. His debut CD “Possible Beginnings” has been acclaimed as “…simply brilliant.” (Colorado Music Buzz) and “an amazing lineup of all original music.” (Scene Magazine) Mittal has also been praised for having “… the same inventiveness [as author Peter Lavezzoli]…” by Hindustan Times (Kolkata, India). This stems from his approach to composition and improvisation, where Mittal seeks to create music that relates to his diverse background of both American and East Indian heritage, drawing inspiration as much from straight-ahead jazz and the avant-garde as from musical traditions of India and modern grooves. 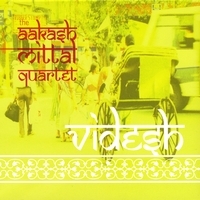 Aakash Mittal’s primary ensemble, “The Aakash Mittal Quartet,” performs all original music at such Colorado venues as Dazzle Restaurant and Lounge, Bliss Café, Vita, the Ft. Collins Jazz Experience, the UNC Jazz Festival, the Boulder Creek Festival, the Grand Junction Jazz and Arts Festival, and the Estes Park Jazz Festival. In 2009 the quartet toured and performed at the Cultural Center of Chicago, The Dakota Jazz Club in Minneapolis, Box Awesome in Lincoln NE, and Studio 222 in Fargo. He also leads a standards- based jazz duo, a Brazilian duo, and a classical flute and harp duet. Aakash Mittal has composed over 30 pieces for Jazz quartet and was commissioned to write a piece for the “Ethos West” chamber orchestra series that combines the instrumentation of a Jazz sextet with Indian instruments tabla and sitar. To expand his knowledge of the Indian tradition Mittal traveled to Kolkata, India in 2009 and studied Classical Indian music with world renowned artists Pandit Tanmoy Bose and Prattyush Banerjee. Aakash Mittal received a BM in Saxophone Performance at The University of Colorado at Boulder. “…the same inventiveness [as Indian music author Peter Lavezzoli]…” Hindustan Times (Kolkata, India). As a music educator Mittal has been running a private lessons studio since 2002 and was a faculty member at The Lesson Studio L.L.C. from 2007 through 2008. He has taught jazz and classical approaches to saxophone, clarinet, flute, composition, and music theory. Aakash Mittal gave a workshop on original music and jazz as a guest artist at Concordia College in 2009. He has also taught ensembles, including the Cherry Creek Jazz Band, the Loveland High School saxophone section, the Thompson Valley saxophone and clarinet section, the Windsor High School Clarinet and Flute section, as well as 6th grade woodwind students at Lucille Erwin Middle School, Crest View elementary, Columbine Elementary, Foothills Elementary, Fairview High, University Hill Elementary, Creek side Elementary, and High Peaks Elementary. To develop younger audiences Mittal gave a presentation to first and fifth grade students about Jazz as a guest speaker at Twin Peaks Charter School in Longmont. Aakash Mittal and the Aakash Mittal Quartet are available to give clinics and workshops with topics for students and audiences of all types. Topics may include but are not limited to: Topic: Beginning Jazz Improvisation for musicians For: Musicians who already have some profitency on their instruments but are interested in learning the jazz style Details: We could teach the class some basics of jazz improvisation starting with a common scale that would work over the blues. Then how to apply that scale to rhythm so that it becomes an improvised phrase. We would teach the class one or two standard jazz tunes so that they can leave with some new repertoire as well as the knowledge of how to practice and jam/improvise over it. It will also deepen the knowledge a jazz fan will have for the music from a musicians perspective. I have had great success with this method with varying ages. Topic: What is Jazz? For: Children with little or no experience with jazz Details: We could do a simple performance of a jazz composition and talk about the basics of how to listen to jazz as well a appropriate jazz edict. Students would not need to bring an instrument but could learn how to improvise rhythmically through clapping. We will also discuss some of the most famous jazz musicians they should know about such as Louis Armstrong and Duke Ellington. We can also demonstrate some of the vast differences of styles that exist within the jazz genre. aka. Swing, Latin, Funk, Blues, etc. Topic: Advanced Jazz techniques For: Musicians who already have studied jazz Details: We could cover more advanced approches to improvisation. How to play jazz in "odd" time signatures. The use of ethnic traditions such as Classical Indian music in modern Jazz. How to improvise so that your solo builds and "tells a story." All About Jazz musician pages are maintained by musicians, publicists and trusted members like you. Interested? Tell us why you would like to improve the Aakash Mittal musician page.